New York-based DFA Studio has unveiled plans for a soaring wooden tower in Central Park that could actually purify the heavily contaminated Jacqueline Kennedy Onassis Reservoir. The proposed tower measures 712 feet tall with a 112-foot-tall spire – and if it comes to fruition, it will be the world’s tallest timber tower. 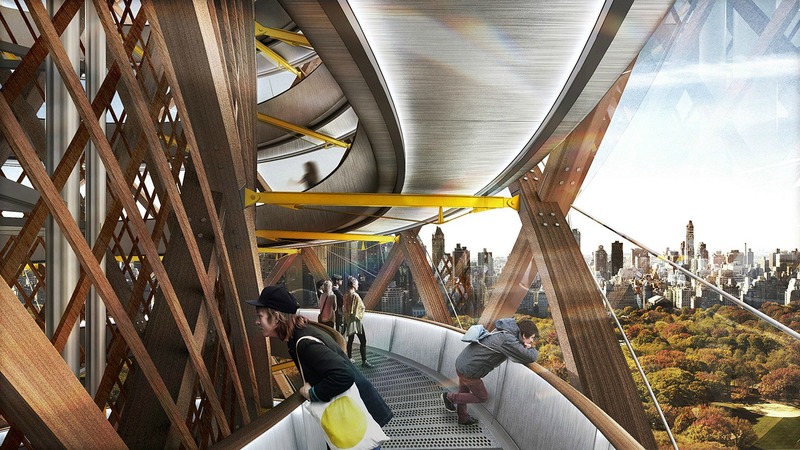 The tower’s helix structure is wrapped with a lattice of curved timber beams. The building would be anchored securely to a pre-cast concrete base with tensile steel cables. A transparent material covers the tower’s exterior, providing 360-degree views as visitors climb up to the top. The Jacqueline Kennedy Onassis Reservoir currently contains an estimated one billion gallons of stagnant, contaminated water. 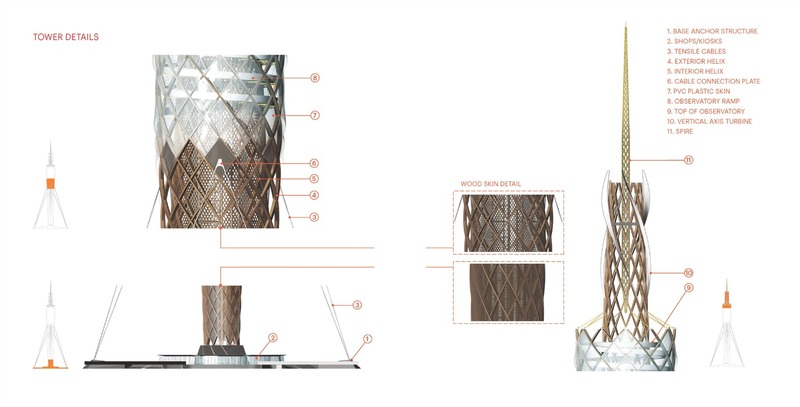 The tower’s filtration system could potentially convert the body of water into a clean pond. New York-based DFA Studio has unveiled designs for a soaring timber tower for Central Park that would pull double duty as a filter for the heavily contaminated Jacqueline Kennedy Onassis Reservoir as well as an observation deck providing stunning city views. If the proposed 712-foot-tall tower with a 112-fot-tall spire comes to fruition, it will be the world's tallest timber tower. 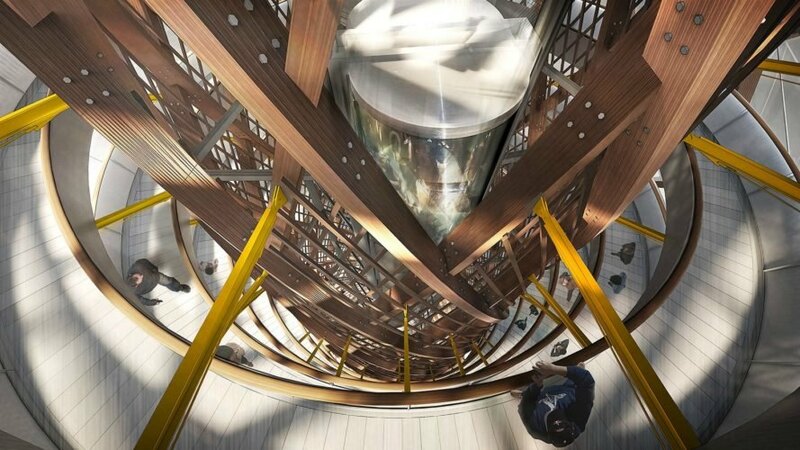 Plans for the tower call for the structure's helix center to be wrapped with a beautiful lattice of curved glue-laminated timber beams. The structure would be anchored securely to a pre-cast concrete base with tensile steel cables. A transparent material would cover the tower's exterior so that visitors will be able to see stunning NYC views as they climb up to the 360-degree viewing platform at the top of the tower. 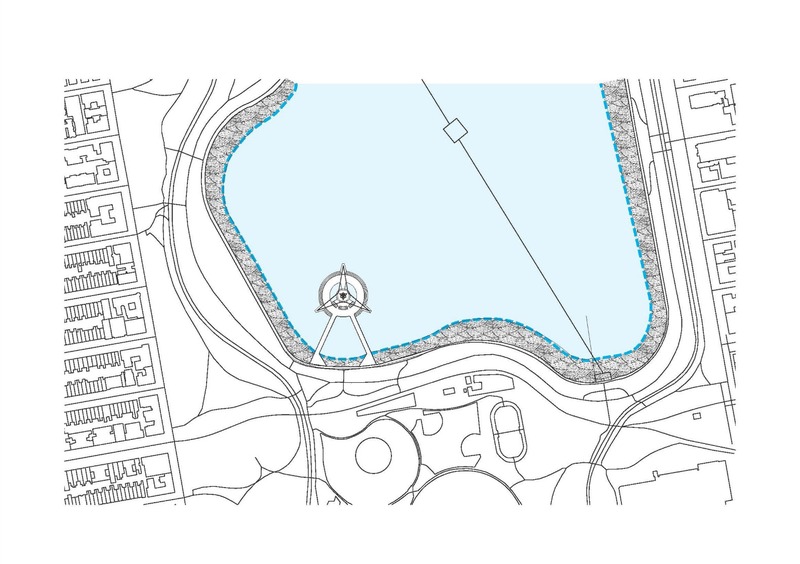 The proposed site of the tower, the Jacqueline Kennedy Onassis Reservoir, currently contains an estimated one billion gallons of stagnant, contaminated water. 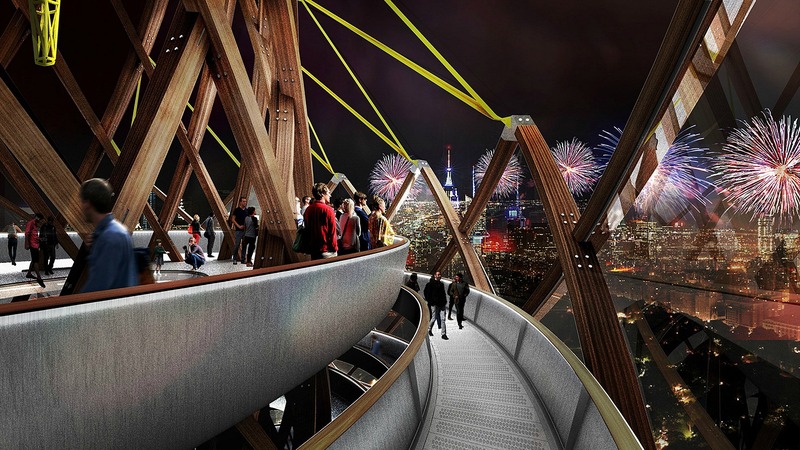 The tower would have a wrap around observation deck with stunning views of the city. The tower's filtration system could potentially convert the body of water into a clean pond. Water Filtration system for the tower. The tower's integrated filtration system (as well as the elevators) would be powered by a wind turbine installed at the top of the tower. The tower would have two elevator platforms. If the ambitious project comes to fruition, the 112-fot-tall spire would make the tower the world's tallest timber tower. The timber tower would filter the contaminated water. 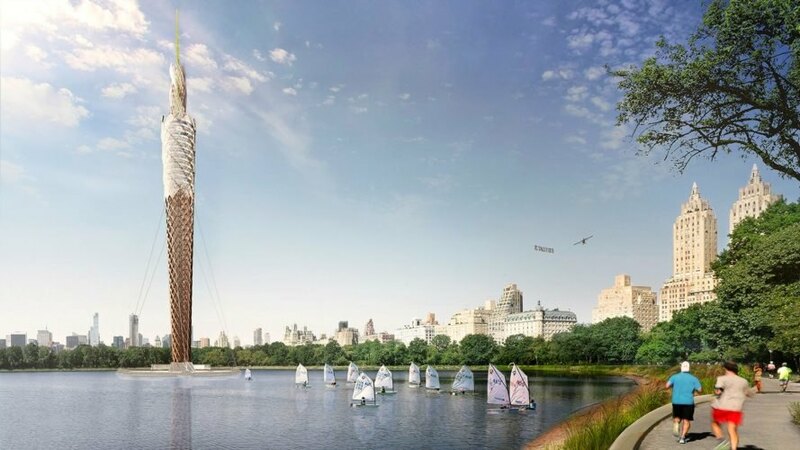 New York-based DFA Studio has unveiled plans for a soaring wooden tower in Central Park that could actually purify the heavily contaminated Jacqueline Kennedy Onassis Reservoir. 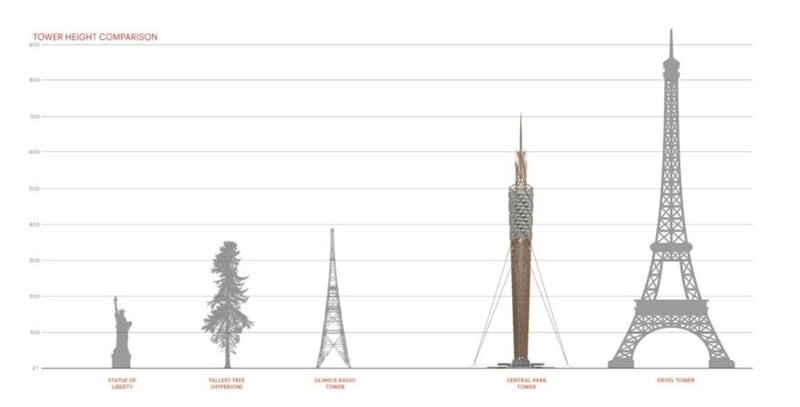 The proposed tower measures 712 feet tall with a 112-foot-tall spire - and if it comes to fruition, it will be the world's tallest timber tower.